Target's latest circular includes a special deal for those purchasing certain models of the Apple iPhone , Apple iPad and Apple iPod touch. Buy the 16GB Apple iPhone 5, already on sale for $149.99 with a signed two-year pact, and get a $25 Target gift card. According to the ad, if you trade in your old handset the retailer will throw in some more money on the gift card. The deal covers Verizon, AT&T and Sprint branded models of the phone. Buy the 16GB Apple iPad mini Wi-Fi for $329.99 and Target will give you a $40 gift card. Purchase the 16GB fourth-generation Apple iPad Wi-Fi for $499.99 and Target will toss ya a $50 gift card. While other Wi-Fi and Wi-Fi+ cellular iPad models are available, the gift card is only good for an iPad with a Retina display, or the Apple iPad 2. 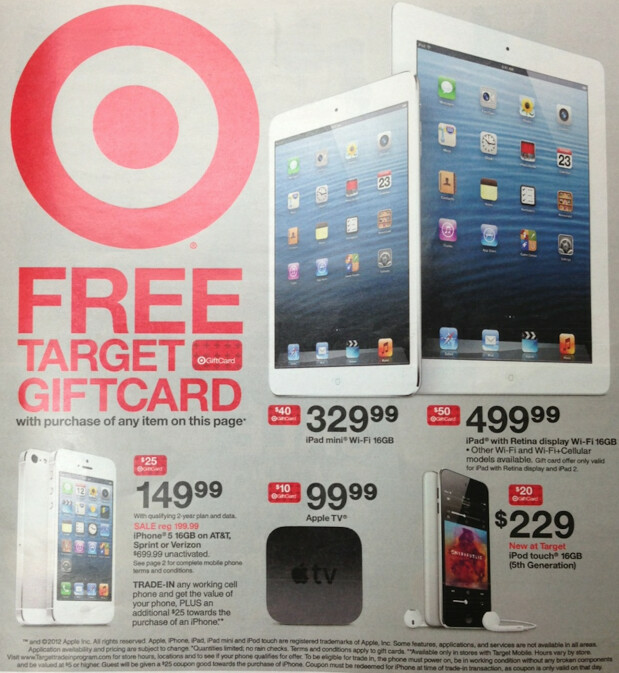 Lastly, buy a 16GB 5th-generation Apple iPod touch for $229 and get a $20 Target gift card. We should point out that the deal is not being offered by every Target location. 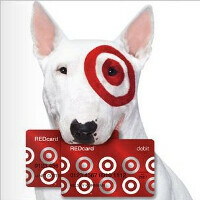 Some are not participating in the iPhone part of the deal but will honor the gift card offer for the iPad and iPod. Your best bet is to call your local store first before heading over there. With all of the deals for the Apple iPhone 5 we've seen lately, it sure seems like the shelves are being cleared in anticipation of a new model. The new iPod Touch for $229 doesn't have the 5MP camera/camcorder in the rear. Also, the 5th generation iPod Touch's aren't selling as well as the 4th generation model. It's hard to justified an enhanced MP3 player with wifi capabilities for that price when you can get an used android smartphone for much less. If you look at 6-month-old or even 1-year-old android smartphones with decent spec's are much better value propositions.